Imagine my surprise when Chandra’s brownies were everything I had imagined a perfect brownie to be. Not only were her brownies perfection, but Chandra was sweet enough to share her recipe freely, so I am passing it along to you just in case, like me, you are hunting for a perfect brownie recipe. 1. Pre-heat oven to 350 F. Line an 8x8 inch baking dish with parchment paper or aluminum foil (not wax paper). 2. In a small bowl mix together the flour, baking powder and salt. A lot of bakers suggest sifting the dry ingredients together at least once to break up any limps and to make sure it’s mixed up nicely. 3. Over medium/low heat melt the butter with the chocolate chips. Once chocolate and butter are melted and smooth add the condensed milk and vanilla and remove from heat. 4. Stir in dry ingredients and nuts (if using them), and pour into your prepared baking tray. 5. Bake for approximately 35 minutes. Brownies usually don’t appear done when they’re done, so you can insert a wooden toothpick into the center to check if it’s still gooey. 6. Cut into squares while still warm (but not too warm). 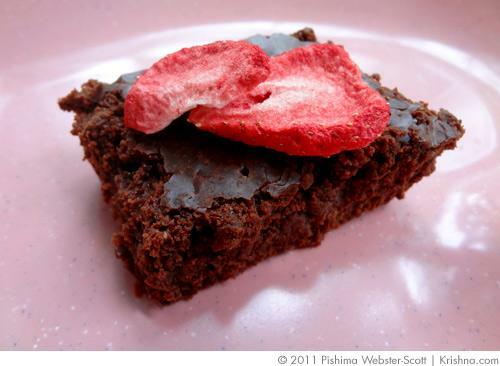 *These brownies would probably be equally delicious made with carob chips instead of chocolate. If you do happen to try these with carob, let me know how they turn out and if you had to make any adjustments. It’s often not an exact exchange of carob for chocolate, so let me know how much carob you used so we can share it with our readers! Well, let's starve then! Give a break! Submitted by Anonymous on Sat, 04/28/2012 - 03:41. They are PERFECT! Chewy browny with no eggs, was looking for this kind of recipe since long time. People, what can be more vegetarian than chocolate made of cocoa beans! And if it does make you happy (however never made me that "happy", you probably meant something else, not chocolate!) - well, that is the purpose of any food you eat - to make you happy and satisfied! Otherwise we shouldn't eat anything - even drink water can make you happy, so water is not permitted now?! Well, surely, people made up so many "can't eat" stuff that makes even them confused! Come on now! Everybody knows what is right and wrong, nobody has any rights to tell anyone what to do(eat or not), if someone is vegetarian it is completely up to him, and what to eat that person knows very well, even child knows what it means to be vegetarian! So, those who "advise" a lot - Relax! Submitted by Anonymous on Fri, 09/23/2011 - 14:16. Submitted by Anonymous on Fri, 09/23/2011 - 14:10. Submitted by Anonymous on Fri, 09/23/2011 - 14:06. Submitted by uddhi (not verified) on Thu, 09/22/2011 - 14:30.